119:1.1 It was a solemn occasion on Salvington almost one billion years ago when the assembled directors and chiefs of the universe of Nebadon heard Michael announce that his elder brother, Immanuel, would presently assume authority in Nebadon while he (Michael) would be absent on an unexplained mission. No other announcement was made about this transaction except that the farewell broadcast to the Constellation Fathers, among other instructions, said: "And for this period I place you under the care and keeping of Immanuel while I go to do the bidding of my Paradise Father." 119:1.2 After sending this farewell broadcast, Michael appeared on the dispatching field of Salvington, just as on many previous occasions when preparing for departure to Uversa or Paradise except that he came alone. He concluded his statement of departure with these words: "I leave you but for a short season. Many of you, I know, would go with me, but whither I go you cannot come. That which I am about to do, you cannot do. I go to do the will of the Paradise Deities, and when I have finished my mission and have acquired this experience, I will return to my place among you." And having thus spoken, Michael of Nebadon vanished from the sight of all those assembled and did not reappear for twenty years of standard time. In all Salvington, only the Divine Minister and Immanuel knew what was taking place, and the Union of Days shared his secret only with the chief executive of the universe, Gabriel, the Bright and Morning Star. 119:1.3 All the inhabitants of Salvington and those dwelling on the constellation and system headquarters worlds assembled about their respective receiving stations for universe intelligence, hoping to get some word of the mission and whereabouts of the Creator Son. Not until the third day after Michael's departure was any message of possible significance received. On this day a communication was registered on Salvington from the Melchizedek sphere, the headquarters of that order in Nebadon, which simply recorded this extraordinary and never-before-heard-of transaction: "At noon today there appeared on the receiving field of this world a strange Melchizedek Son, not of our number but wholly like our order. He was accompanied by a solitary omniaphim who bore credentials from Uversa and presented orders addressed to our chief, derived from the Ancients of Days and concurred in by Immanuel of Salvington, directing that this new Melchizedek Son be received into our order and assigned to the emergency service of the Melchizedeks of Nebadon. And it has been so ordered; it has been done." 119:1.5 "And at noon on this day, without previous announcement and witnessed by only three of our brotherhood, this visiting Son of our order disappeared from our world as he came, accompanied only by a solitary omniaphim; and this record is now closed with the certification that this visitor lived as a Melchizedek, in the likeness of a Melchizedek he worked as a Melchizedek, and he faithfully performed all of his assignments as an emergency Son of our order. By universal consent he has become chief of Melchizedeks, having earned our love and adoration by his matchless wisdom, supreme love, and superb devotion to duty. He loved us, understood us, and served with us, and forever we are his loyal and devoted fellow Melchizedeks, for this stranger on our world has now eternally become a universe minister of Melchizedek nature." 119:2.3 Simultaneously with the reception of this request on Salvington, Michael initiated the second of those extraordinary proclamations of intention to be absent from the universe headquarters for the purpose of "doing the bidding of my Paradise Father," promising to "return in due season" and concentrating all authority in the hands of his Paradise brother, Immanuel, the Union of Days. 119:2.6 And then came that eventful day on which there arrived the newly appointed System Sovereign, designated by the universe authorities as the permanent successor of the deposed Lutentia, and all Palonia mourned the departure of the most noble and the most benign system ruler that Nebadon had ever known. He was beloved by all the system and adored by his fellows of all groups of the Lanonandek Sons. His departure was not unceremonious; a great celebration was arranged when he left the system headquarters. Even his erring predecessor sent this message: "Just and righteous are you in all your ways. While I continue in rejection of the Paradise rule, I am compelled to confess that you are a just and merciful administrator." 119:3.7 Never, since this marvelous bestowal as the Planetary Prince of a world in isolation and rebellion, have any of the Material Sons or Daughters in Nebadon been tempted to complain of their assignments or to find fault with the difficulties of their planetary missions. For all time the Material Sons know that in the Creator Son of the universe they have an understanding sovereign and a sympathetic friend, one who has in "all points been tried and tested," even as they must also be tried and tested. 119:4.1 It was at the end of one of the periodic millennial roll calls of Uversa that Michael proceeded to place the government of Nebadon in the hands of Immanuel and Gabriel; and, of course, recalling what had happened in times past following such action, we all prepared to witness Michael's disappearance on his fourth mission of bestowal, and we were not long kept waiting, for he shortly went out upon the Salvington dispatching field and was lost to our view. 119:4.2 On the third day after this bestowal disappearance we observed, in the universe broadcasts to Uversa, this significant news item from the seraphic headquarters of Nebadon: "Reporting the unannounced arrival of an unknown seraphim, accompanied by a solitary supernaphim and Gabriel of Salvington. This unregistered seraphim qualifies as of the Nebadon order and bears credentials from the Uversa Ancients of Days, certified by Immanuel of Salvington. This seraphim tests out as belonging to the supreme order of the angels of a local universe and has already been assigned to the corps of the teaching counselors." 119:4.4 Never, throughout the seven years of this assignment, was this Trinity Teacher Son wholly persuaded as to the identity of his seraphic associate. True, all seraphim during that age were regarded with peculiar interest and scrutiny. Full well we all knew that our beloved Sovereign was abroad in the universe, disguised as a seraphim, but never could we be certain of his identity. Never was he positively identified until the time of his attachment to the bestowal mission of this Trinity Teacher Son. But always throughout this era were the supreme seraphim regarded with special solicitude, lest any of us should find that we had unawares been host to the Sovereign of the universe on a mission of creature bestowal. And so it has become forever true, concerning angels, that their Creator and Ruler has been "in all points tried and tested in the likeness of seraphic personality. " 119:5.1 A little over three hundred million years ago, as time is reckoned on Urantia, we witnessed another of those transfers of universe authority to Immanuel and observed the preparations of Michael for departure. This occasion was different from the previous ones in that he announced that his destination was Uversa, headquarters of the superuniverse of Orvonton. In due time our Sovereign departed, but the broadcasts of the superuniverse never made mention of Michael's arrival at the courts of the Ancients of Days. Shortly after his departure from Salvington there did appear in the Uversa broadcasts this significant statement: "There arrived today an unannounced and unnumbered ascendant pilgrim of mortal origin from the universe of Nebadon, certified by Immanuel of Salvington and accompanied by Gabriel of Nebadon. This unidentified being presents the status of a true spirit and has been received into our fellowship." 119:5.2 If you should visit Uversa today, you would hear the recounting of the days when Eventod sojourned there, this particular and unknown pilgrim of time and space being known on Uversa by that name. And this ascending mortal, at least a superb personality in the exact likeness of the spirit stage of the ascending mortals, lived and functioned on Uversa for a period of eleven years of Orvonton standard time. This being received the assignments and performed the duties of a spirit mortal in common with his fellows from the various local universes of Orvonton. In "all points he was tested and tried, even as his fellows," and on all occasions he proved worthy of the confidence and trust of his superiors, while he unfailingly commanded the respect and loyal admiration of his fellow spirits. 119:5.4 Not until the completion of this bestowal did it finally dawn upon us that Michael was probably going to incarnate in the likeness of his various orders of universe personalities, from the highest Melchizedeks right on down to the mortals of flesh and blood on the evolutionary worlds of time and space. About this time the Melchizedek colleges began to teach the probability of Michael's sometime incarnating as a mortal of the flesh, and there occurred much speculation as to the possible technique of such an inexplicable bestowal. That Michael had in person performed in the role of an ascending mortal lent new and added interest to the whole scheme of creature progression all the way up through both the local universe and the superuniverse. 119:6.3 Michael appeared on the headquarters of constellation five as a full-fledged morontia mortal of ascending status. 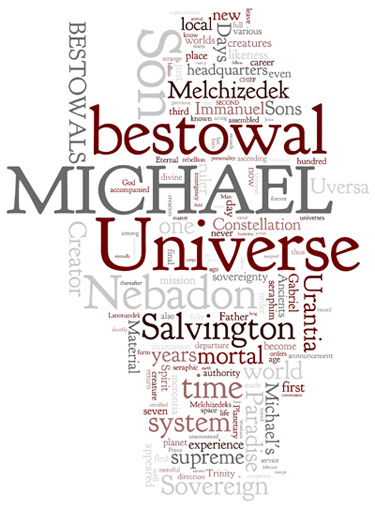 I regret that I am forbidden to reveal the details of this unnumbered morontia mortal's career, for it was one of the most extraordinary and amazing epochs in Michael's bestowal experience, not even excepting his dramatic and tragic sojourn on Urantia. But among the many restrictions imposed upon me in accepting this commission is one which forbids my undertaking to unfold the details of this wonderful career of Michael as the morontia mortal of Endantum. 119:6.4 When Michael returned from this morontia bestowal, it was apparent to all of us that our Creator had become a fellow creature, that the Universe Sovereign was also the friend and sympathetic helper of even the lowest form of created intelligence in his realms. We had noted this progressive acquirement of the creature's viewpoint in universe administration before this, for it had been gradually appearing, but it became more apparent after the completion of the morontia mortal bestowal, even still more so after his return from the career of the carpenter's son on Urantia. 119:6.5 We were informed in advance by Gabriel of the time of Michael's release from the morontia bestowal, and accordingly we arranged a suitable reception on Salvington. Millions upon millions of beings were assembled from the constellation headquarters worlds of Nebadon, and a majority of the sojourners on the worlds adjacent to Salvington were gathered together to welcome him back to the rulership of his universe. In response to our many addresses of welcome and expressions of appreciation of a Sovereign so vitally interested in his creatures, he only replied: "I have simply been about my Father's business. I am only doing the pleasure of the Paradise Sons who love and crave to understand their creatures." 119:7.7Jesus' human parents were average people of their day and generation, and this incarnated Son of God was thus born of woman and was reared in the ordinary manner of the children of that race and age. 119:7.8 The story of Michael's sojourn on Urantia, the narrative of the mortal bestowal of the Creator Son on your world, is a matter beyond the scope and purpose of this narrative. 119:8.1 After Michael's final and successful bestowal on Urantia he was not only accepted by the Ancients of Days as sovereign ruler of Nebadon, but he was also recognized by the Universal Father as the established director of the local universe of his own creation. Upon his return to Salvington this Michael, the Son of Man and the Son of God, was proclaimed the settled ruler of Nebadon. From Uversa came the eighth proclamation of Michael's sovereignty, while from Paradise came the joint pronouncement of the Universal Father and the Eternal Son constituting this union of God and man sole head of the universe and directing the Union of Days stationed on Salvington to signify his intention of withdrawing to Paradise. The Faithfuls of Days on the constellation headquarters were also instructed to retire from the councils of the Most Highs. But Michael would not consent to the withdrawal of the Trinity Sons of counsel and co-operation. He assembled them on Salvington and personally requested them forever to remain on duty in Nebadon. They signified their desire to comply with this request to their directors on Paradise, and shortly thereafter there were issued those mandates of Paradise divorcement which forever attached these Sons of the central universe to the court of Michael of Nebadon. 119:8.2 It required almost one billion years of Urantia time to complete the bestowal career of Michael and to effect the final establishment of his supreme authority in the universe of his own creation. Michael was born a creator, educated an administrator, trained an executive, but he was required to earn his sovereignty by experience. And thus has your little world become known throughout all Nebadon as the arena wherein Michael completed the experience which is required of every Paradise Creator Son before he is given unlimited control and direction of the universe of his own making. As you ascend the local universe, you will learn more about the ideals of the personalities concerned in Michael's previous bestowals. 119:8.4 These various will aspects of the Deities are eternally personalized in the differing natures of the Seven Master Spirits, and each of Michael's bestowals was peculiarly revelatory of one of these divinity manifestations. On his Melchizedek bestowal he manifested the united will of the Father, Son, and Spirit, on his Lanonandek bestowal the will of the Father and the Son; on the Adamic bestowal he revealed the will of the Father and the Spirit, on the seraphic bestowal the will of the Son and the Spirit; on the Uversa mortal bestowal he portrayed the will of the Conjoint Actor, on the morontia mortal bestowal the will of the Eternal Son; and on the Urantia material bestowal he lived the will of the Universal Father, even as a mortal of flesh and blood. 119:8.5 The completion of these seven bestowals resulted in the liberation of Michael's supreme sovereignty and also in the creation of the possibility for the sovereignty of the Supreme in Nebadon. On none of Michael's bestowals did he reveal God the Supreme, but the sum total of all seven bestowals is a new Nebadon revelation of the Supreme Being.